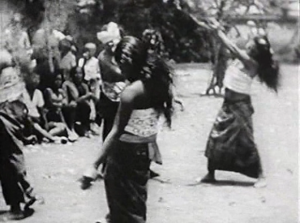 As ethnography method and textual style originates in anthropology, cases of dance ethnography appear in the first anthropological studies from the late 19th century, included in elaborate descriptions of rituals. Dance is an indicator of social and cultural circumstances, often identifying points of conflict and driving transitions. Dance ethnography has revealed political and religious control of dance, in colonial and postcolonial settings as well as in many other contemporary situations of social inequality that can be said to lead to resistance or social critique, as in the revitalisation of ethnic dance or the making of alternative expression through dance. A specific program has been selected to observe the diverse and enriching tradition of dance. Each film is set in a different country, and is taken between 1951-1981. The Balinese ceremonial dance drama in which a struggle between a witch and a dragon is played out to the accompaniment of comic interludes and violent trance seizures. In the northern summer, Inuit (Eskimos) gather together from all over the Arctic Circle. They meet to participate in the Northern Games, the traditional games passed on through generations of Inuit. Most of the events are based on the skills and physical endurance so necessary for survival in the Canadian Arctic. Not only do they come to compete in such contests as canoe racing, harpoon throwing and the good woman competition but also to meet friends and relations, to sing, feast and dance the age old drum dances.